"Kayla Day is your typical suburban American 13-year-old: shy, insecure, and trying so hard to fit in with the popular crowd at school that she can’t see past her awkwardness and recognize her own specialness. 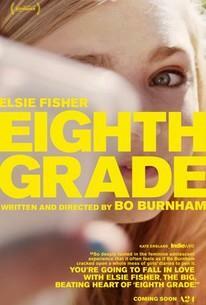 In Eighth Grade, writer-director Bo Burnham’s poignant and perceptive coming-of-age story, the bumbling but upbeat Kayla (played by Elsie Fisher in a spectacular, star-is-born performance) shows us the postmillennial perils of social media and the hard-won lesson of marching to your own drumbeat. "The film traces Kayla’s last weeks in middle school. She eats alone at lunch, never gets invited to parties except out of pity, and can barely muster the courage to speak to her classmates — never mind connect with them. In one crushing scene where year-end superlatives are handed out, she’s voted Most Quiet. The only time that she feels comfortable (and even that’s debatable) is when she sits down in front of her computer in her bedroom to make affirmational YouTube videos. In public, she’s a bundle of all-too-real neuroses, which aren’t helped by her single dad (a superb, low-key Josh Hamilton), who grapples with being her biggest cheerleader while constantly mortifying her despite his good intentions.